That’s something you may want to talk to the agency about, Paul. 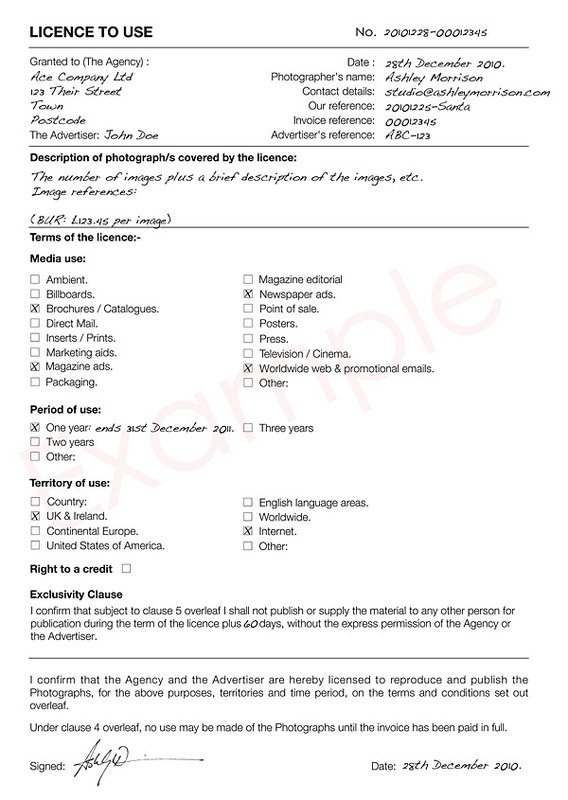 When shooting a Hotel, for example, that was commissioned by either a Booking agent or a Design company, I would normally put the Hotel’s name and address against the Granted to (The Agency) part – and then the name of the person in the Booking agent or Design company that I was dealing with, as The Advertiser. That way, if the Hotel did decide to use another Booking agent or Design company later on, then the ‘Licence to use’ would still be valid… assuming it hadn’t expired of course. about in this article? I’d really like to be a part of group where I can get comments from other experienced people that share the same interest. If you have any recommendations, please let me know. Thanks a lot! Shakodo is a Question and Answer site focused on practical pricing for Photography. best guide to this I have seen so far! Thanks!